The Boston Township Hall served many purposes before its current use. 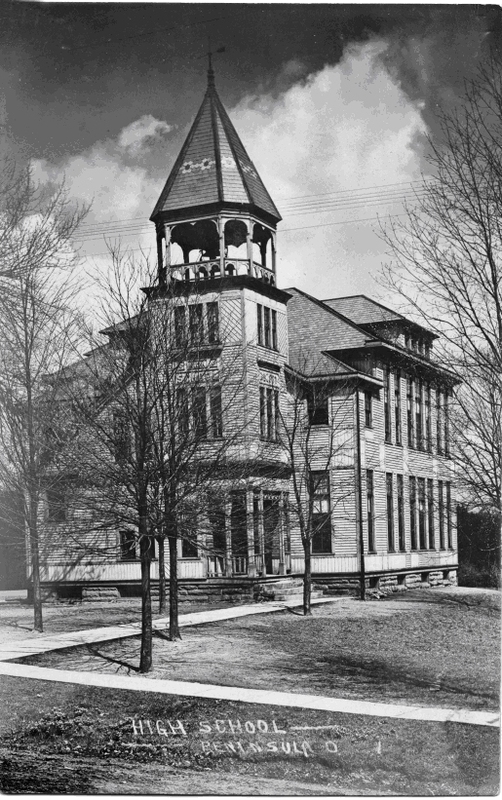 The building was constructed in 1887 by the Peninsula Board of Education to bring together those students who lived within the village limits. The architect of this unique stick-style building is John Eisenmann who designed many prominent buildings including the Cleveland Arcade. Eisenmann was also the first professor of civil engineering at Case Western Reserve University and wrote the first building code for the city of Cleveland. In his later years, Eisenmann designed the state flag for Ohio which was adopted in 1902 and advocated and provided drawings for Perry's Monument. Prior to construction of this building, students who lived on the west side of the Cuyahoga River attended the one-room school across the street (now the G.A.R. Hall). Students who lived on the east side of the river went to school on the second floor of the Peninsula Village hall located on the southeast corner of Rt. 303 and Akron-Peninsula Rd. In 1919, the Peninsula Board of Education merged with the Boston Township Board of Education and this building transferred to the new district. The brick addition was completed in 1920 in response to a state initiative to consolidate the remote one-room schoolhouses located in the township into a centralized school. The architects for the brick addition are Harpster & Bliss who designed many of the prominent buildings in the Akron area including O.C. Barber's mansion and other buildings at Anna Dean Farm. Due to increased enrollment, a new Boston Township High School was built in 1930 on Bronson Avenue. In 1939, the Trustees of Boston Township purchased this property from the Board of Education for $100. Union Grange #2380 took up residence on the first floor of the wood building and the second floor was relegated to storage. The first floor of the brick addition housed the Peninsula Library from 1947 to 1964. Boy Scout and Girl Scout troops met in the classrooms on the second floor of the brick addition. By 1985, time had taken its toll on the two buildings and they were closed by order of the State Fire Marshal. The non-profit Boston Township Hall Committee, Inc. was formed in 1990 and took on the task of coordinating the renovation of the buildings and finding new uses for them. A $1.2 million renovation was begun in 1999 to rehabilitate the buildings. Today, the two buildings house Boston Township offices, the Cuyahoga Valley Historical Museum, offices for professional firms, and rooms that can be rented for parties or receptions. Should you want to contact the Boston Township Hall Committee, Inc., they can be reached at (330) 657-BTHC.